The day we've all been waiting for! last six weeks, all of your kind comments truly keep me going!! I like to think of her and the ORC as motivator extraordinaire! I know you just want pictures today!!! I'll be back with follow up posts next week, I have lots of details and DIYs to share! I'd be working with what I had and getting my DIY mojo on! Never underestimate the power of paint!! I painted everything you can imagine - cabinets, hardware, tile, hood, chandeliers! 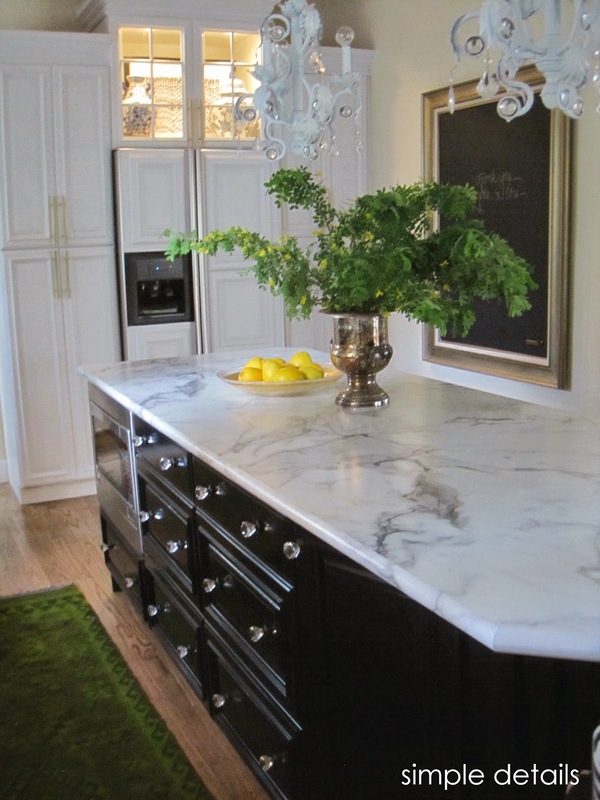 Calacatta Marble was my choice for our island countertop...it's Formica! I know what you're thinking, but look at it, Formica has come a long way! I love it and can't wait to share the details with you. and how you can avoid using an electrician. 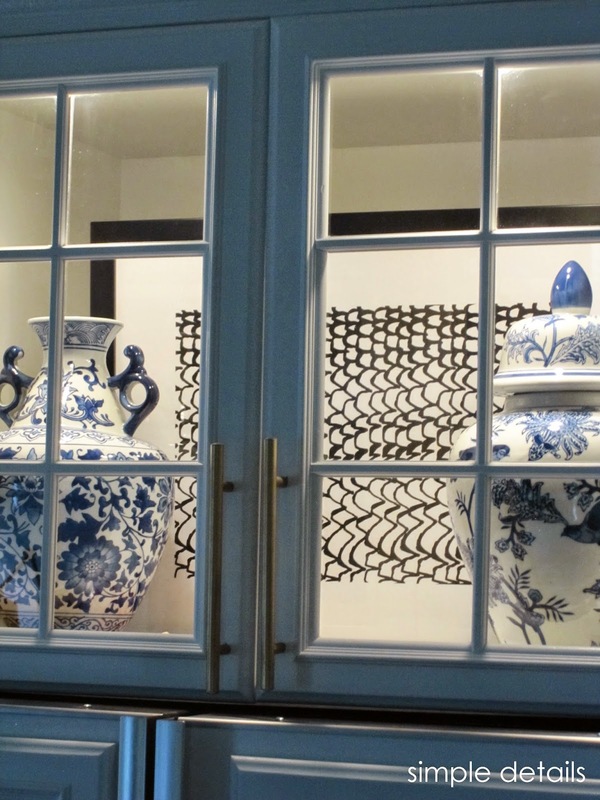 Minted paired with blue and white ginger jars in my lighted cabinet is a pretty statement. Three framed needlepoint florals from Mr. Simple's grandma fit perfectly here. DIYs for the hood and super easy valances to come. I knew from day one they would all rock this challenge, let's go see! and Formica for providing material. Yay! I am up late with a sick baby and was hoping some ORC reveals might be posted in the wee hours of the morning ... what a treat to be one of the first to see your amazing kitchen!! I just love it, and I can't wait to read more of the DIY details! Congrats and let's have a celebratory lunch after you've had time to catch up on some rest. Oh my stars, I don't know where to begin. The hood is better than I imagined. Hope you feel the same way. It is rustic but modern. 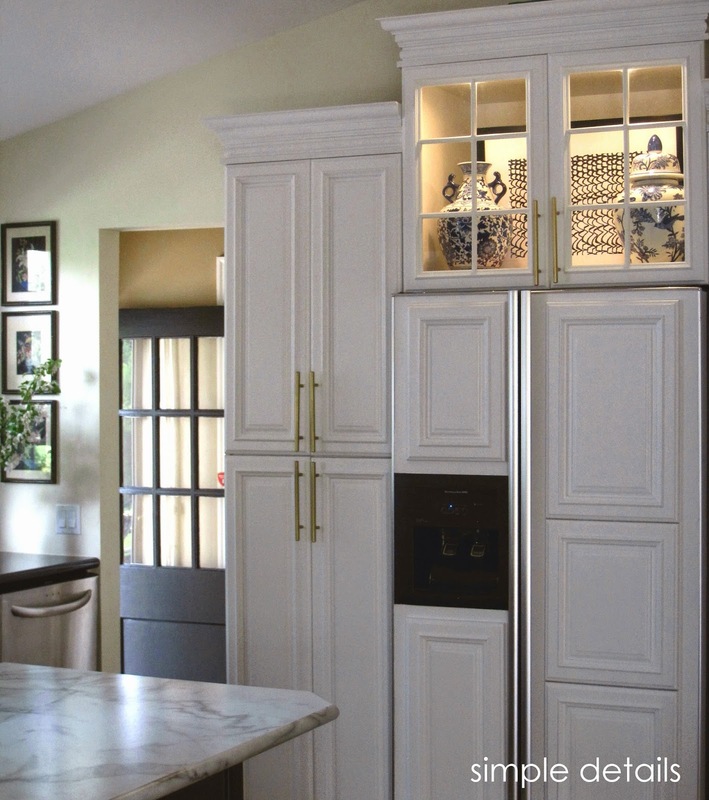 The white cabinets and brass hardware look so clean & bright and fresh! Your new slipcovers and cornices feel updated yet traditional. I can't believe you were able to accomplish all of this in 6 weeks. Congratulations. It is stunning! Pam, you have truly outdone yourself this time, the entire kitchen is amazing! I loved what you were starting with, but painting the tile and cabinets gave the space a whole new feel. The hood is incredible, I can't believe you were able to do that, and I love that you mixed traditional with modern so well. The hardware, painted chandeliers, and that gorgeous swing arm lamp are all perfection together! I love it!!! Enjoy!!!! This is beyond brilliant & gorgeous. A wonderful transformation. The follow up posts will be fab!! WOW, pam! are you just over the moon? it's gorgeous! 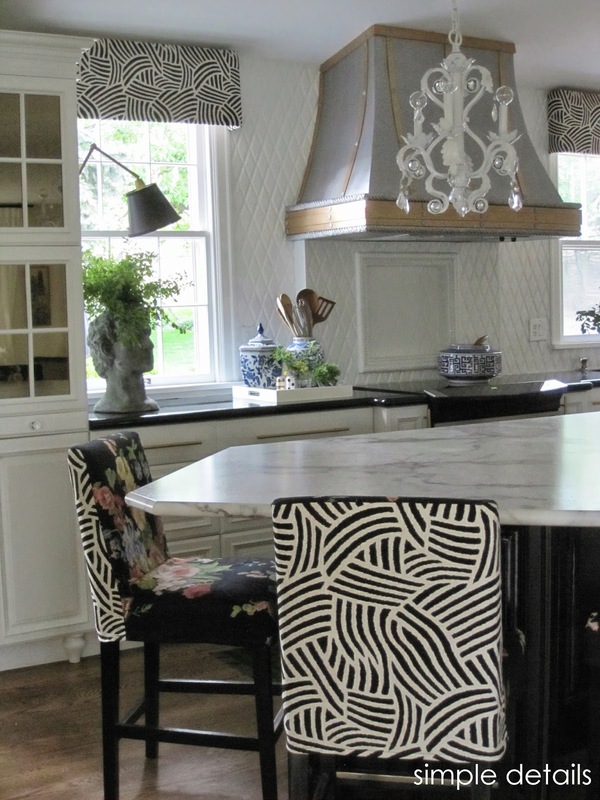 i love the new fabric on the stools, and that hood is amazing! Pam, it is so so gorgeous!! I love the backsplash, the chairs, the island is amazing and those sconces are perfect! It's amazing the difference the small change of painting that tile makes! I am in love!! Unbelievable, Pam. I can't believe that it is the same space, only painted. I am just dying over the formica, window treatment, painted cabinets, hardware...of course blue & white. You are always amazing, and you ever out did yourself. 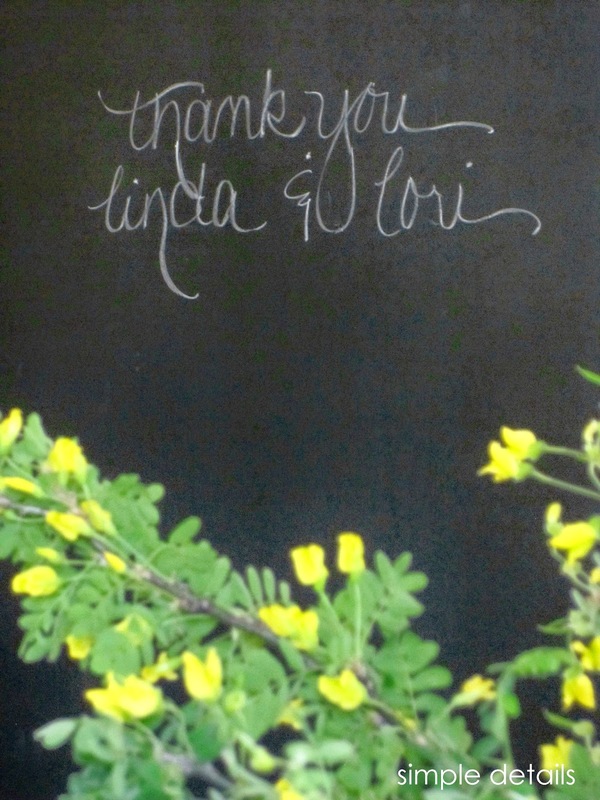 Thanks for the lovely chalkboard mention. I love the fresh white, I always do. The star of this reveal is totally your fabulous hood makeover and this kitchen is so you now. What a fabulous job!!! Pam, I am blown away! This is one heck of a DIY project. That hood, there are not words. I love every last detail of your kitchen. Can't wait to hear more about your DIY projects. Bravo friend. That is amazing!! The range hood is awesome. Everything is awesome. Can't wait for more details. Great job!! Pam, this is over the top stunning!! I love the hood and knew I would. That is formica? Wow!! It has come a very long way. That lamp is what I am considering to put on each side of my bed. I love that style. I have been holding my breath fir this one and it did not disappoint! Not sure what I love more- the hood, the sconce, or the fact that you held on to your "you piece" the chalkboard! Awesome job Pam! Absolutely beautiful Pam! I agree, all of the details are just so well thought out. I cannot believe those tiles and how amazing they look! High five Pam! You've outdone yourself on this one, Pam! Every single element is so "you!" Love the crisp black and white, your new hardware, the blue and white accessories, the super fun barstools, your stylish chandy update, and that amazing hood! 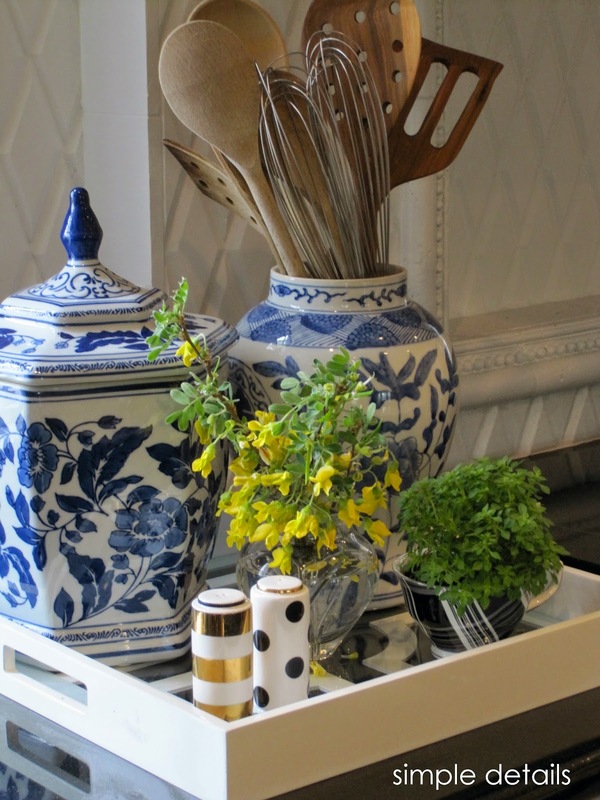 Surely you need to go out to dinner tonight so your pretty kitchen doesn't get dirty, right? :) Well done, friend! Wow, wow, WOW! I'm so impressed with all that you were able to do over six weeks! I'm feeling like quite the slacker right now, let me tell you. It looks gorgeous Pam - you must be exhausted! I can't wait to hear all of the DIY details - love that sconce sans electrician - I'm all ears! Um, excuse me that hood is fancy pants to the max!!! It truly is amazing what paint can do to that space. Will definitely have to look into those counter tops as well! Bet you don't want to see a paint brush for a while :) Looks incredible! LOVE, LOVE, LOVE all that you did in here! Absolutely wonderful job, Pam! Now that it's over you can go and ENJOY this new room of yours! Kudos!!! Kerplunck! The sound of me falling to the floor. This room is beyond words. I love every detail, especially the hood. I cannot wait for the DIY news. Great job! YAY its beautiful! Seriously crushing on your new counters...hmm that might just be what we need! cant wait to see the DIY hood post! Wow, Pam!! Amazing is an understatement. The range hood transformation is incredible. So excited for you!! That's Formica? Love it all! Wow, it's amazing how paint can cahnge everything! I love your new kitchen and your marble countertop... I want it! This was such a great kitchen before -- beautiful windows and nice cabinets. But whoa what a difference paint makes! The painted tile is so so smart but the hood is blowing my mind up! It looks AMAZING!!! Great job Pam! 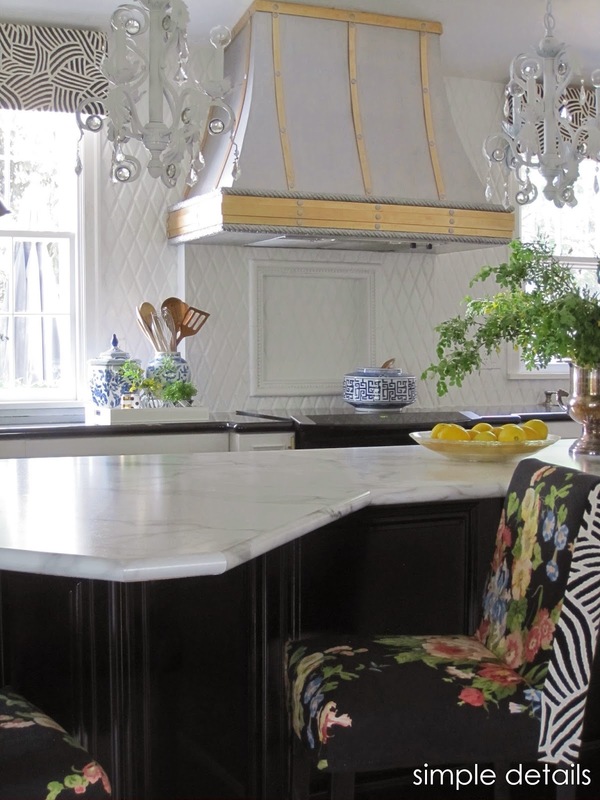 Those marble counter tops are gorgeous! Fabulous job Pam, Bravo!! LOve the difference!! I cannot get over the transformation. I will be giving Formica a second look. Bravo! What a great facelift! That Formica countertop looks so good and that hood! Wonderful job Pam. I love it all!!! The hood is spectacular...and well the formica left me speechless....I'm glad you left the chalkboard. It looks so chi. I love the art you chose from Minted and can you please tell me the name of the black floral fabric of your stools....I ADORE IT!! You are so talented and really designed a fabulous room. I want to keep looking at all the photos! Albertina, the floral fabric is Ralph Lauren Ladies Mantle Floral Wrought Iron. I can not get over what you did with that hood- remarkable...truly. And the Formica still blows my mind- absolutely beautiful. The whole transformation is amazing- love the stool fabric and that plant head dude is my favourite. Amazing work! Such an amazing transformation, your kitchen is GORGEOUS!!! And I still cannot believe that "marble" is Formica! Congratulations on a fabulous job!! The transformation is really spectacular. I am really dying to hear about the hood. The Formica is amazing. I have been afraid of marble with my husband and his red wine. Great job! Pam it is so damn good!!! :) That hood transformation is incredible and the painted tile, the cabinets and hardware, the sconces and the new valances. Every last detail is just perfect and beautiful. So well done my friend!! What a fantastic redo of your kitchen! My favorite things- the black/white/green palette, the awesome hood, the mixed hardware, keeping the chalkboard,the formica, the jointed sconce light and the bust planter. So many fantastic ideas you have and you always figure out a way to realize them. Well done, now have a glass of wine in your beautiful new kitchen and relax! Formica - just wow. Everything looks awesome, Pam. And I know you'll have a tutorial coming up but WHAT is the gold metal strip stuff on your hood?? Hope you can get some rest now!! I love this stunning makeover! It's beautiful before but it looks even more gorgeous now. 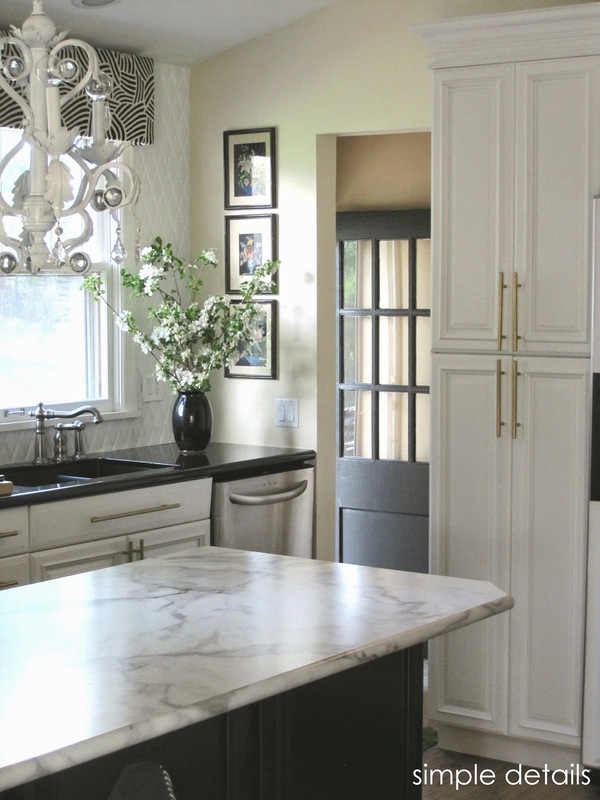 I love that fabulous hood, the new painted cabinets, the new hardware and your new countertop. All your hard work and efforts truly paid off! Well done. Aaaaaaahhhhh! Pam, it's official, your a magician!!!!! LOVE IT! 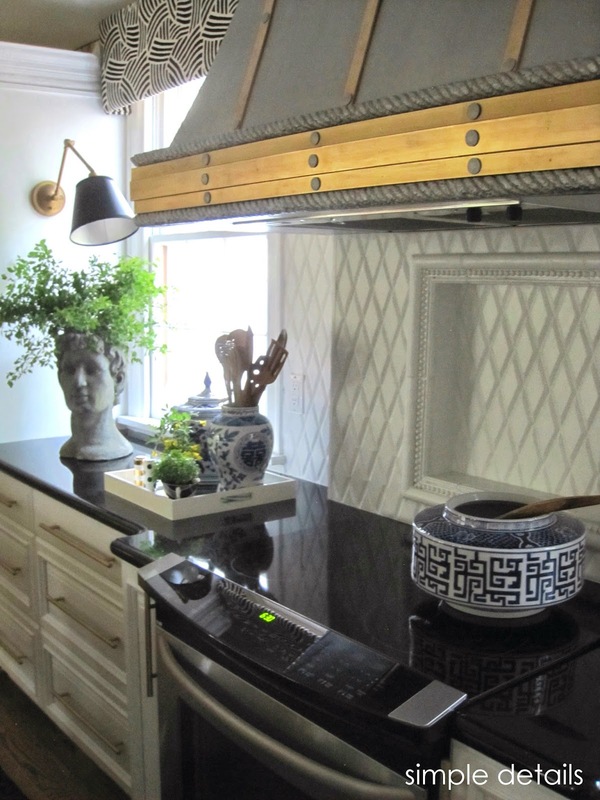 That hood is truly stunning and I also think your formica looks fabulous on your island - super chic kitchen dear and I don't think anyone can think a lot of the work done here was DIY!!!! Calling BHG, you need to feature this kitchen before anyone else does!!!!!! Waiting on your valence tutorial since I really want one for my kitchen windows too! WOW Pam...I was dying to see this reveal...love love love it all!! You did an amazing job!! Love the fabrics you chose for your barstools...so pretty! Well done!! Every element is just as lovely as the next! I am blown away by the before and afters. Amazing transformation. I adore what you did to the hood!! I looked at purcha$ing a hood similar to that and had to ditch that crazy pipe dream. I love every thing you have done. This looks great! I like the two tone chairs. such a great fabric combo. OMG Pam you are amazing! The wonders of a clever mind and a few cans of paint.... I LOVE how you were able to transform this space with a vision and some elbow grease, it is just fabulous! And I too am glad you kept the chalkboard! The hood, the hood!! You know this is going to go viral on interest. What a terrific transformation of your kitchen. You all must be so pleased. The transformation is CAh-RAZY good! I bet you are so in love with all of it. Beautiful (and clever) work! Pam, you are officially a diy genius. What a transformation. Still can't believe that counter is formica. And the hood! The chair fabric is gorgeous, love all the details. So impressed! Pam, I will officially be stalking your blog for all of the tutorials. Your kitchen is BEYOND fabulous. And that formica? That is a game changer! STUNNING work. Fabulous job! YOu know I've always wondered about the new marble formica, and have been debating real marble vs. white granite and was leaning toward marble, but this could be so great too! Love what you did and congrats! Gorgeous, Pam! Those sconces are to die for! I'm still reeling over your hood and tile makeover. Your kitchen is picture perfect now! Love it!!! I cannot POSSIBLY say enough about how much I love your kitchen! Wow!! That hood! My word, you have some serious talent. I just want to transport your kitchen to my house. I would be happier forever in there. Did I say how much I love it? Your kitchen is PERFECT and SOOO you! I love the island... isn't it amazing how far laminate has come! I would so install that in my house or a clients any day of the week! I love the hood... looking forward to the tutorial! And that lamp!!! perfect place for it! Bravo Pam! Everything looks so, so wonderful. I watched as you worked and when I saw you painting the tile I knew it was going to be epic. The new "marble" is particularly stunning. You outdid yourself. It's just a drop-dead showplace!!!! I can't get over that 'marble' countertop! Formica!? Amazing!!!! I love how much more the chalkboard and other details pop out against the white counters. It all looks fantastic. What a great job!!!!! And again - those counters!!!! Wow! That is a stunning transformation. Amazing!! I love the fresh, updated look! I can't get over that hood, it's soo good! Loving the island too, I can't believe it's formica! Can't wait to hear about all the DIYs and details! Get out right now. 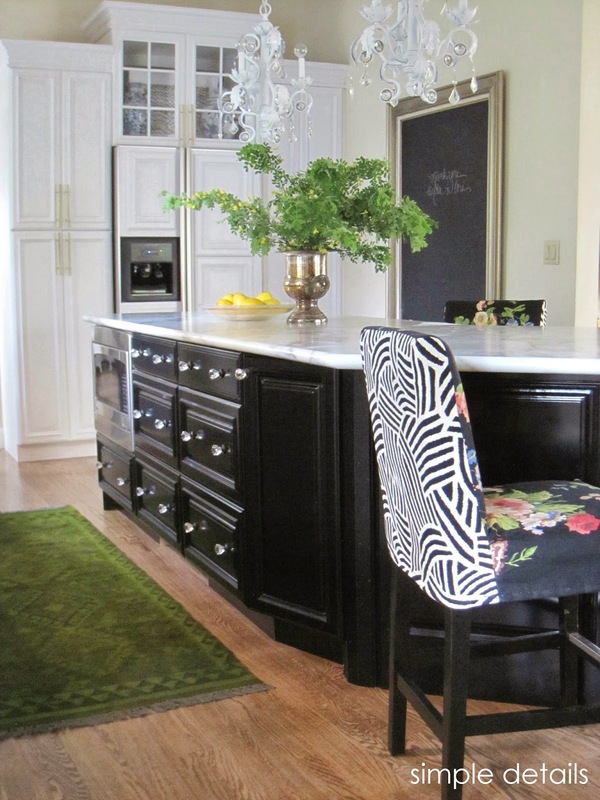 Blown away by the transformation - and how is that island top formica?!!!!! Who knew. That hood!! Those chairs. I could go on and on. Congratulations on all your hard work. What a show stopper!!! As always Pam you make everything look so beautiful. Your bar stools, the blue and white pottery, your chalkboard, your statue urn, the hood and painted tile... I could go on and on it's absolutely beautiful! I bet your loving it! Amazing Pam!! Love the graphic black and white mixed with the floral and the head bust! I can't believe the island counter!!! Can you please shoot me an email at eclecticallyvintage@gmail.com - I need to ask you something. Incredible! Such a beautiful transformation. The first couple of photos I was focusing on your painted updates and when I saw the island I thought, "Ah, I see..she was saving her budget for that marble- gorgeous!" I can't believe that's formica! My other favorite element is that hood and I can't wait to learn more. You really did a beautiful job mixing up modern and traditional- just LOVE it! Girl you knocked it out of the park! LOVE the hood SO much! Can't even believe you got all of this done in 6 weeks!! I'm sorry I haven't been around to see the weekly posts...have had a LOT of technical issues. Not fun! Looking forward to all the details. Amazing transformation - I'm really excited to hear about the formica. I'm so impressed with your brilliance!! How in the world did you do that hood??! I agree with Sherry. That can't really be Formica. You are crazy talented and I'll be watching for the details on all of this. Incredible job! Really spectacular! Formica looks amazing! And I love your fabric choices for the chairs and valance. Fab! Wow!! I totally agree with the transformation abilities of paint (i did the same thing w/my daughters room in the link-up, but a kitchen!!!! Again, WOW!). I cannot wait to hear more details about your gorgeous hood! I love all the hard work and then it's the details like that sconce, your chalkboard and grandma's needlepoints that make this kitchen stunning! Well done! I can't wait to see tutorials! What an amazing transformation! Gives me hope for a future home in the town where I live - rustic/wood/stone tile is very popular right now. I'll probably be painting a lot. LOVING the marble Formica! I love this! It's my favorite so far of all the makeovers and I'm almost done looking through them all. Aaahh!! Beautiful, so beautiful! I haven't been receiving your email updates. I've heard a lot of blogs have been having this problem. So, it was so good to see your blog today!! Wow, very impressive! I am getting ready to start a budget kitchen makeover and the countertops and cabinets are the big expense that I am trying to save money on. In the pictures the formica looks incredible. How has it head up, do you still love it and would you recommend it? Also, what color did you paint the cabinets? I"m guessing you posted about the details but I can't seem to find that post. Would love to know more. thank you! one room challenge...73 more rooms!